Laura Abbott: From Independent Midwife, To Senior Lecturer in Midwifery. Following 5 years of employment as a Registered General Nurse specialising in intensive care, I trained as a Registered Midwife and worked as an independent midwife. In this role, I was responsible for a group of pregnant women who wanted continuity during their pre-and post-natal experience outside the context of hospitals. It also involved working closely with colleagues and midwives in the NHS to ensure seamless care, should additional maternity involvement be needed. I thoroughly enjoyed my time working independently as a midwife, as I got to know the women really well and played a key role in their lives during their pregnancies, birth and in the postnatal period. I undertook additional qualifications to become a Supervisor of Midwives which led on to a Master’s programme. During this time, I also did some hourly-paid teaching within the School of Health and Social work at the University of Hertfordshire. I loved teaching in the School, as the environment was very welcoming and supportive. This experience motivated me to pursue a career in academia, as I knew I had an inquisitive mind, and loved the thought of having the opportunity to engage in research in my area of expertise. I successfully applied for the post of Lecturer in Midwifery in 2008 when my youngest of three sons became one year’s old. When I started, I was supported to complete a teaching qualification and progressed to Senior Lecturer soon after. As my passion lied in research, I was encouraged to start a School-funded part-time DHRes in 2012, focusing on the experience of pregnant women in prison. My research looks at what it is like being pregnant in prison; I am exploring the whole experience, not just considering facts and figures, and interviewing women so that their own voices can convey what it is like to be pregnant in an English prison. Access to participants in my study has been a very complex procedure. 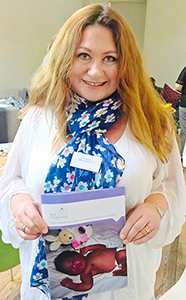 I underwent training at the Charity ‘Birth Companions’, an incredibly compassionate and non-judgemental organisation, to be able to support women in prison during pregnancy, labour and their post-natal experiences, which can be very complex for mothers in this context. This experience gave me an understanding of the challenging rule-governed setting I was entering, and the vulnerability of the women, so I was prepared when I applied for ethical approval from the National Office Management Service. During my visits to prison, I observe the environment and build rapport with the female inmates, but also the staff, as they have been generous in allowing me access and need to know that I am trustworthy and not a security risk. It has been a long and challenging journey. The women in prison really want to talk about the kind of support they are receiving and have a lot to say about their varied experiences. Many of them have had difficult lives and I have been struck by their resilience. I hope to give a voice to an invisible group of women. My School has supported me during my fieldwork, by funding my travel to prisons and making sure I am able to work flexibly. I also received impact funding from the University which covers my travel to conferences: I have been able to present my work to a multidisciplinary audience around the country. I have been invited to deliver a keynote talk at the UNICEF Babyfriendly National conference in November 2016. 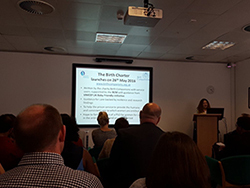 I have worked with the Charity ‘Birth Companions’ on the publication of a Birth Charter which consists of recommendations to inform Policy on pregnant women in prison: recommendations include references to the right to attend antenatal classes, the requirements for additional nutrients during pregnancy, and entitlement to counselling if the mother is separated from the baby at birth. This work has interest from Offender Management Services and I hope to contribute to future policy with Birth Companions. I am coming out of the field at the end of this summer, and plan to work temporarily part-time in order to focus on writing up my research. I am also currently in discussion with my line manager about freeing up further time to focus on networking, write up research papers and to start supervising PhD students. Future plans include continuing with my research and establishing a research team with the aim to continue to feed into government Policy and Law to ensure that changes are made to how women, and staff, are supported in the prison setting.